The Prayer Shawl Ministry provides hand crafted shawls representing a mantle of care and love from our parish to the recipient. 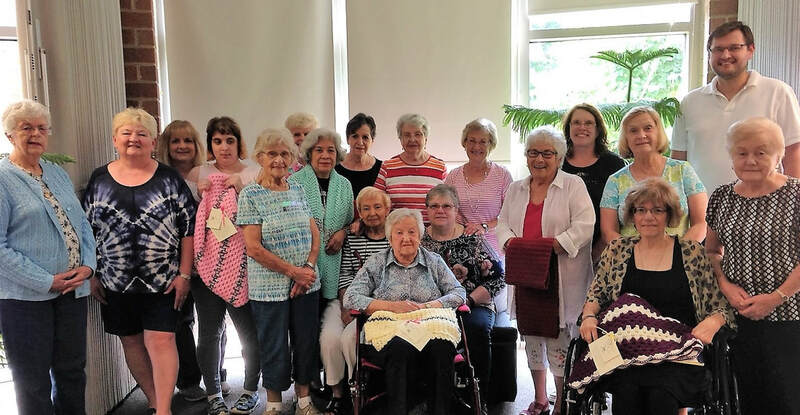 The love of knitting and/or crocheting and love of neighbor have been combined into a prayerful ministry that reaches out to those in need of comfort and solace. ​Many blessings are crafted into each shawl and prayerful intentions are continued throughout its creation. When a shawl is completed, a final prayer is offered for the intentions of the recipient and it is then sent to that person with our prayerful wishes. ​Shawls may be created for those undergoing medical procedures, suffering serious illness, grieving the loss of a loved one, or for anyone needing a blanket of compassion. The Prayer Shawl group meets on the 2nd Tuesday of every month at 12:30 PM in the St. Francis Room. The meeting lasts for approximately 30 minutes and is followed by the Crochet gathering. At this meeting there are more prayers said over each creation along with a special blessing by a priest. You can either make a prayer shawl by yourself at home or you can come to our monthly meetings at Church. Our Crochet group meets on the 2nd and 4th Tuesday of each month where there is lively conversation and companionship while we work on our crochet/knitted projects. We share patterns, teach each other new stitches, and create our lovely shawls. ​Please e-mail Kay Cernak at parishoffice@sfaorland.org to get started.